In this paper, we examine collaborative design projects in school contexts with many different stakeholders. We look at the value created for and by different stakeholders, focusing on value as a benefit, which is experienced – perceived and determined – by the beneficiaries themselves in the value co-creation process. As our focus is in “value-in-use”, i.e., value which emerges through activities taking place in a specific space, time, and context, we define value through subjective experience of people involved. We apply in our study the concept of value co-creation, where value is understood emerging from collaborative activity between actors participating in the activity. We see that the value co-creation lens provides a useful means for the CSCW community to scrutinize and make sense of collaborative design projects. We categorized the perceived value for each stakeholder and discuss how these categories can help in gaining a deeper understanding of the value gained in collaborative design work as well as how value co-creation lens in more general can be used as a tool in collaborative design projects. Computer-supported cooperative work (CSCW) research is concerned with collaboration among people supported by technology as well as other kinds of material artefacts. The focus has persistently been on people, practices, technologies, and artefacts as forming complex constellations that enable collaboration, or hamper it. Researchers have concentrated on understanding and conceptualizing work, work practices, and cooperative work, or devising support for it. Collaborative design work has also received attention within CSCW research already for long, acknowledging that design is a political and social process involving multiple stakeholders and areas of expertise (e.g., Bødker et al. 1988). An old concern that still prevails centers around the complexities involved with participatory design process among designers and users (Bratteteig and Wagner 2016; Ciolfi et al. 2016; Kensing and Blomberg 1998). An extensive body of research on collaborative design work also exists, this literature identifying various kinds of stakeholders involved in design in different kinds of contexts such as in museums, e-research, participatory citizenship, and healthcare, to mention some (e.g., Bjørn and Boulus-Rødje 2015; Borchorst et al. 2009; Borning et al. 2005; Bossen and Markussen 2010; Ciolfi et al. 2016; Fitzpatrick and Ellingsen 2013; Karasti et al. 2010; Lawrence 2006; Lee 2007). This study purports to shed some new light on this old yet still vibrant topic by introducing the value co-creation lens to CSCW research. We want to demonstrate the benefit of this lens in conceptualizing, understanding, and further supporting collaborative design work involving various kinds of stakeholders. In the CSCW community, some interest around this topic has already emerged. In somewhat similar vein to our study, Bossen and colleagues (Bossen et al. 2010; Bossen et al. 2016) address evaluation of stakeholder gains in Participatory Design projects. The role of different stakeholders in systems development, the value of systems for users (microfinancing as one example, Adeel et al. 2013), and the value of the system in general level have all been already studied by CSCW researchers. Value sensitive design approach has interested researchers particularly in the ACM hosted CSCW conference, while co-creation has been examined in the European CSCW conference, for example, in connection with preserving cultural heritage (Ciolfi 2013). However, CSCW research typically focuses on the collaborative design process and/or the object of collaboration and the studies that focus on co-creation typically define co-creation as a process of collaborative design or as a creative process. In this paper, however, we focus on the value created in the collaborative process and use the specific concept of value co-creation as it is used in service science (Grönroos 2011) and Service-Dominant Logic (Vargo and Lusch 2008). This approach has not been in focus anywhere in CSCW studies. 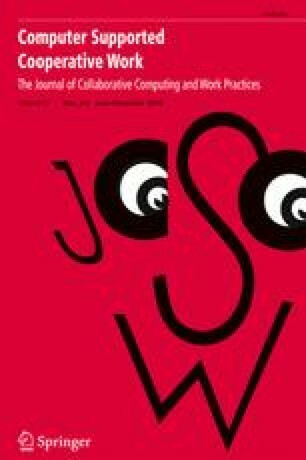 We argue that the viewpoint of co-creation of value in collaborative design work offers a valuable approach to CSCW research. We ask, therefore, as our research questions: what kind of value emerges for different stakeholders in collaborative design work, and how could value co-creation lens help make sense of collaborative design process? To answer those, we examine four of our collaborative design projects conducted in school contexts, complementing that with more general data about projects in school environment. By utilizing the value co-creation lens, we look at the value co-created for and by different stakeholders, the concept of value co-creation leading us to see such value as emerging from collaborative activity between participants. Next, we present the value co-creation lens used in this study. Then we describe our data and how we analyzed it. Discussion on the results will follow, and finally we conclude the paper together with limitations and paths for further research. In this paper, we focus our analysis on how success of collaboration can be evaluated and analysed by examining the collaborative process through the lens of value co-creation, i.e., we see the collaborative process as an effort for creating conditions where all stakeholders are able to successfully participate in value co-creation, thus creating value that is relevant for themselves as well as for the others. We borrow this way of thinking from service science (Grönroos 2011) and service-dominant logic (Vargo and Lusch 2008). The service-dominant logic (SDL) challenges the goods-dominant logic by proposing that all economic activity is based on service (Vargo and Lusch 2016). Goods, including computing technology, are seen as resources, which are needed to create or deliver a service, and therefore technology is designed and defined through its role in the integrated resource pool (Spohrer et al. 2007). Value and value co-creation are central concepts in the SDL framework (Lusch and Vargo 2006b; Vargo and Lusch 2008). Related to that, the process of combining resources – goods but also knowledge and other resources – of different stakeholders is needed to achieve successful value co-creation (Lusch and Vargo 2006b; Vargo and Lusch 2016). The stakeholders are not only the traditional “firm” and “customer”; instead, they may be many different private or public actors (Vargo and Lusch 2016). In service thinking, the core of service lies in acting for the benefit of someone (i.e., creating value for them) and hence, a service is defined as ‘value-creating support to another party’s practices’ (Grönroos 2011, p. 285). In SDL, the object of design is conceptualized not through the technical artefact but through the service that is a result of collaborative activity and resource integration of the stakeholders. In this paper, we concentrate on the value co-creation approach and Axioms 2, 3, and 4 of the five axioms of SDL (Vargo and Lusch 2016) as they define the intertwined concepts of value and value co-creation as understood in SDL. The Axiom 2 defines value as something that is ‘co-created by multiple actors, always including the beneficiary’ (i.e., the actor receiving value) in the value co-creation process. The Axiom 3 defines that ‘all social and economic actors are resource integrators’, and the Axiom 4 defines value to be always determined by the beneficiary through an experience. These three Axioms emphasize that value cannot be ‘delivered’ from one actor to another, nor can it be ‘embedded’ into goods to deliver value to someone. Instead, SDL states that value is created through a collaborative activity. In order to achieve successful value co-creation, stakeholders need to bring their resources to the combined resource pool and take active role in integrating the resources (Vargo and Lusch 2016). Value is phenomenologically determined by each stakeholder participating in value co-creation. Their experience and perception are in key role when determining the created value (Lusch and Vargo 2006a, p. 44; Vargo et al. 2008). In this paper, our analysis specifically uses the concepts of value and value co-creation and the related Axioms of the SDL. The other Axioms of SDL are not used in our analytical work. They focus, for example, on understanding the role of service in economic exchange, such as Axiom 1 stating that service is the fundamental basis of exchange, and goods operate as distribution mechanism for service (Vargo and Lusch 2016). The focus of our research is not on analysing any specific service from the marketing or economic point of view, as the nature of service activity examined in this paper is experimental and instrumental in doing research. Based on Axioms 2 and 4, we define value in this study as a benefit which is experienced – perceived and determined – by the beneficiaries themselves in the value co-creation process, i.e., it is something that the person judges to be worthwhile (see Cockton 2006). Another way of defining value has been through a ratio between perceived benefits and sacrifices (Monroe 1979; Ravald and Grönroos 1996). Zeithaml (1988), when discussing the customer’s experience of product’s value, defines it as an ‘overall assessment of the utility … based on a perception of what is received and what is given,’ taking into consideration the subjective nature of the experienced value. Therefore, value is highly contextualized and subjective, and it is embedded into everyday experiences of people (Heinonen et al. 2013). According to Axiom 2 in SDL, co-creation of value is a joint activity of the stakeholders, where everyone is needed for creating value for the others and themselves (Vargo et al. 2008). Value co-creation is successful only if all stakeholders perceive receiving value from the service (Vargo et al. 2008). If value co-creation is successful, the stakeholders want to and can continue collaboration by continuing to bring their resources into the process of service delivery (Axiom 3). If value co-creation fails for some stakeholders, it is unlikely that they want to continue collaboration, thus withdrawing integration of their resources in the collaborative service delivery process. The exact definition of subjective experience of value is challenging due to its phenomenological nature (Heinonen et al. 2013). Cockton (2006) defines value as something worthwhile. However, Cockton (2006) discusses ‘worth’ in the context of designing ‘things’ and concentrates on the design process resulting in design outputs which would ‘motivate people to buy, learn, use or recommend an interactive product’ (Cockton 2006). Our SDL based approach does not address how “worthwhile” the design artefacts are, or how the design process can be organized to result in artefacts of worth. Instead, we examine the activity where “things” or design artefacts are used as resources in collaboration, and value emerges through the collaborative activity of stakeholders. Here, value actualizes only when something happens through collaboration. Thus, value is relational and emerging in interaction. As the perceived human experience is instrumental in our definition of value, it means that the experience of value is always dynamic and temporal (Law et al. 2009). The experience of value can be and most likely will be different in different phases of service encounter. Kujala and Väänänen-Vainio-Mattila (2009) in their study note that in order to understand users’ perspective to value, one needs to understand what is important and what motivates users to engage in the process, discussing how motivations and values – ‘conceptions of desirable ways of behaving’ – are related. As stated by SDL, value is phenomenologically determined by each stakeholder who participates in value co-creation, and therefore their experience and perception are in key role when determining the created value (Lusch and Vargo 2006a, p. 44; Vargo et al. 2008). In this paper, we decided to connect the experienced value to the innate needs of people (see Alderfer (1972), see also Deci and Ryan (1985) about basic human needs). This enables us to better make sense of the results – to see how value emerges for stakeholders and how they construct their experience of value. SDL has also been criticized for not adequately addressing the sensemaking process to construct the individual’s understanding of value (Heinonen et al. 2013). Hence, we utilized Self-Determination Theory (Deci and Ryan 1985) as an additional theoretical tool to make sense of participants of a collaborative design process construct their experience of value. In SDT especially the concepts relating to internal motivation (Deci and Ryan 1985) are useful as a lens to explain why the stakeholders experience something valuable or worthwhile in the process. In a context like the one we examine in this paper, there are no economic incentives and very few other external rewards as such. Even though the role individuals have in the organization sets certain expectations towards the individuals, also the internal factors play a key role: the work, and the collaboration, is largely based on internal motivational factors from which the experience of value is also derived from. This way, we complement the framework provided by SDL with a deeper understanding of the reasons why people are willing to do something also without tangible external rewards (Deci, 1971) and what are the reasons based on which they perceive the action worthwhile doing. Different need hierarchies and models (e.g., Maslow, 1970; Alderfer 1972) divide basic human needs according to their importance to survival (e.g., existence needs in Alderfer’s ERG theory) but also to higher aspirations in life (e.g., growth needs in ERG). Yet one key level of needs relates to an individual’s relation to his/her community (e.g., relatedness needs). Self-Determination Theory (Deci and Ryan 1985) that explains factors behind intrinsic motivation includes, in addition to Relatedness, also Autonomy and Competence as basic human needs. This is also in line with the premises of SDL, as each stakeholder evaluates the outcome of the process based on their individual interpretative schemes including not only the orientation for the project establishing certain kinds of expectations, but also other aspects that provide value for their different processes (Vargo et al. 2008). The perceived value needs to be interpreted in the context of use, and through subjective perceived experience of the stakeholder (Ervasti 2012). Examination of what value expectations the stakeholders have, how these expectations are fulfilled or how they change during the course of action, and how the stakeholders verbalize and describe their experiences of perceived value after the collaborative activity allows us to understand how the stakeholders perceive the value of the service – in this paper, collaborative process – for them. In this paper, we draw on the SDL and examine the collaborative design process from a value perspective as depicted in Figure 1 below. The collaborative design process is a nexus of different stakeholder processes and practices in which the points of interaction present a platform for the value to emerge from the process (Grönroos 2011). In the participating organizations, there are different stakeholders holding different positions and therefore playing different roles. As the process of collaboration is defined in SDL through resource integration, not only the direct ‘users’ of technology (see Isomursu et al. 2011) are stakeholders but there are also other stakeholders who are needed to provide resources for creating the conditions for collaboration, as in SDL ‘all economic and social actors are resource integrators’ (Vargo et al. 2008). These might include, for example, management who is needed for providing facilities and resources necessary for delivering the service (in schools, principals), or even politicians who create the environment where the service takes place, as in educational system’s case. The different stakeholders have different expectations for the value co-creation process and the value created: their own organizations have specific purposes, which the different activities are aimed to fulfil one way or another, and the purpose of these become merged in the different points of interaction. The design process and the points of interaction are always partly planned and partly unplanned, since the way events unfold cannot be seen in beforehand by the participants. Consequently, also the outcome can be intended only in some aspects and these typically relate to the more tangible benefits (e.g., technical quality by Grönroos 2008, 2011). Many aspects of the value perceived by the stakeholders can be made sense of only afterwards (see e.g. Weick 1995), as the experience unfolds with reflection (Law et al. 2009). These perceived benefits tend to be intangible by nature (e.g., process quality by Grönroos 2008, 2011). The value can be either collective (benefits for the organization) or individual (Cockton 2006) but it is always experienced by the participating individuals, and the experience depends on both internal and external factors explaining the motivation for them to participate in the process. As the collaborative process brings together the stakeholders, the value co-created becomes an entanglement of individually experienced aspects of value. With the example of projects conducted in school contexts, we examine value co-creation through the benefits identified by different stakeholders and how they verbalize and describe their experiences after the collaborative activity. With this, we wish to show how analysis of the success of value co-creation can be used as a tool for understanding, evaluating, and enhancing collaborative design activity. This study can be connected with the Design Research tradition where methods and processes from design practice are utilized as a legitimate method of inquiry, the inquiry ‘revolving around the making of a product, service, environment, or system’ (see e.g. Koskinen et al. 2011; Zimmerman et al. 2010, p. 310). For this study, research material has been generated in four collaborative design projects. This study offers a retrospective reflection on the work done through value co-creation as a theoretical lens. Hence, the study can be said of carrying out research into design, based on which it aims at generating theoretical insights valuable for the practice of design (cf. Frayling 1994; Zimmerman et al. 2010). Research into design here examines the variety of stakeholders and value generated for them through collaborative design, whereas research for design aims at sensitizing designers to this variety and offering designers tools to inquire, appreciate and potentially manage the variety. Our theoretical tools (the value co-creation lens, based on Service-Dominant Logic, and the Self-Determination Theory) guided and inspired both research into and research for design phases. This study is based on the analysis of four collaborative design projects conducted in the context of school. In all the projects, senior researchers together with their Masters’ level students have collaborated with local schools for arranging learning interventions where the children aged 8–15 learned technology design skills through participating in a facilitated technology design process. Length of the projects was about 5 months and the total working time at school varied between 25 and 40 h. See Table 1 for detailed information of the projects. In Project A, the senior researchers approached one of the schools in the City of Oulu with an interest to experiment with participatory design and multidisciplinary work in the context of school. They contacted the school principal who indicated two classes of pupils and their teachers to work with. The school had an interest in technology to begin with and the two teachers were eager to join the project with their classes, with whom they had also earlier experimented with novel pedagogical uses of technology. They ideated the topic of digital portfolio design for the project. The two classes of children took part in participatory design workshops in which they designed digital portfolios for their own use. Two sessions were organized for each class: the first one involving individual work, the second one group work on the topic. Based on children’s creations, the junior researchers created a specification for digital portfolio application that tried to extensively utilize children’s ideas generated during the participatory design sessions. Two Master’s students also continued the work after the design workshops and implemented a functional prototype of the digital portfolio that they then evaluated together with the children. In Project B, the senior researchers had an interest to experiment with participatory design, to support genuine participation of children, and to study and support children’s literacy skills. A Finnish language teacher, who had participated in one of our previous projects and expressed her interest to further cooperate with us, was contacted. She joined the project with her class of pupils. The class took part in developing an adventure game to promote literacy skills of children, utilizing an existing game engine developed in our previous project. In this project, a game editor was added to the game engine to make it possible for children to create new games. The children took part in workshops on game ideation, design, and evaluation as well as editor evaluation. The work was mostly connected with Finnish language lessons, while some art lessons were included, too. The children were given a lot of power of decision in the project: they were allowed to settle the game topic as well as to design it. The junior researchers implemented the game, however. Project C was initiated by one of the junior researchers, who was hired by a comprehensive school in the City and had informed the teachers of the possibility to cooperate with us. One of the teachers of the school contacted us and Project C was established. One class of pupils continued the adventure game development of Project B. Again, the work was connected with Finnish language lessons. This time the teacher chose the topic for the game: the children were to make a game related to the national epic Kalevala. However, the teacher was also very much interested in supporting children’s participation, ownership and agency. The children again took part in workshops on game ideation, design, and evaluation. In this case, they also invited some younger children to act as testers of the game, while the older children arranged the tests. Finally, Project D, similarly to Project C, was initiated by a teacher, who at the same time was a doctoral student of one of the senior researchers and familiar with the cooperation possibility. This project also aimed to involve children as much as possible in game development while also teaching them what it means to collaborate in this kind of project. In this case, there was a group of teachers (history, English language and Finnish language teachers) involved in the project as well as a large number of 7th to 8th graders (see Table 1 for the age of the pupils). The theme of the game was selected so that it served children’s learning of different school subjects involved (related to the historical phenomenon of immigration). All the pupils were involved in game design work. Junior researchers then implemented the game, while ten pupils also took part in programming the game. The 8th graders also arranged testing sessions in which the 7th graders acted as test participants. In addition to the stakeholders in the actual design projects at schools, we realized that school principals are also an important stakeholder group not visible in the design project data. We therefore decided to complement the project data with 13 interviews of school principals in the City area who discuss leading and managing their schools in more general level but who address issues very relevant from the perspective of this paper, too. Interview topics included the careers of the interviewees; change in schools, society, and children; challenges of management and leadership in school context; and the pedagogical use of technology. In relation to these, the principals also discussed a variety of development efforts their schools had taken part. In this paper, we have included the development efforts related to experimenting new teaching and management/leadership methods. Our own projects, i.e., research projects bringing collaborative digital technology design to school context, can be seen as comparable to those from the school point of view. In addition to those, we have included data on efforts related to leading and managing schools more broadly, as these projects very clearly create value to the principals – value that is very relevant from the perspective of our projects, too. When analysing our data, we agreed first our analytical lens and analysis procedure and then, knowing the data well, identified the main stakeholders involved. In the second phase, specific studies were assigned for the authors to conduct in-depth analysis of the data. We went through all the extensive documentation produced in the four design projects, selecting data relevant for this study, and processed the material through content analysis using the analytical lens developed in 2.2 as a sensitizing device. We identified all statements of benefits for the participants, i.e., successful value creation for and by the stakeholders, either created for themselves (“what did I get out of this project”) or for other participants (“what did others get out of this project”). We are unable to report on failed value creation as we have a very small amount of data indicating that happening. We take this as a sign that the projects did not have any major problems but see it possibly also as a result of somewhat biased data collection methods as we definitely know that value creation is not always successful for all the participants (see e.g. Bossen et al. 2012 about frustrations of project participants). As to the value expectations of the stakeholders, we examined those in relation to the reported benefits for some of the stakeholders whenever there was data available. We primarily looked at the created value as reported by participants themselves, e.g., children telling they had fun or learned something. We also examined value created for other stakeholders as observed or described by another stakeholder group, such as, e.g., teachers reporting about children’s learning or what children seemed to have enjoyed. We did a similar kind of analysis for the interviews of principals, looking for stakeholders they mention as well as what kind of value they see that different projects create for these stakeholders, themselves included. As a result of this phase, a lengthy table was created, reporting insights and data excerpts from each study. In the third phase, we discussed our findings and interpretations to form a shared understanding and then combined the findings to form an overall understanding of value co-creation in our data. We abstracted the findings to find common patterns in the data; however, differences and idiosyncrasies of each stakeholder group were also noted. We noticed that while the findings included ‘tangible’ value aspects (e.g. learning new skills), much of the benefits that stakeholders reported were of more intangible nature, relating to aspects such as enjoyment of the process and working with others, and being able to do something of interest. Some of these benefits were organizational in nature and some were individual. This data-driven categorization guided our analysis towards motivational factors that drive human action and make them experience something worthwhile. To help with this fourth and final level of analysis, we chose to use the concepts of SDT (Deci and Ryan 1985) and especially the factors of intrinsic motivation – autonomy, competence, and relatedness – as they help to make sense of the connection between individual and organizational benefits. We therefore updated our theoretical lens to include basic human needs to complement SDL in understanding individual sensemaking of value. Phases three and four eventually led to the creation of Table 2 and Figure 2 in the last section of this paper. In this section, we present the central stakeholders involved in our collaborative design projects conducted in school contexts as well as scrutinize what kind of value our collaborative design projects have produced for each of them. We identified five major stakeholder groups in our cases. They are: (1) teachers, (2) school-children, (3) our Master’s students working in the projects as junior researchers, (4) senior researchers, and (5) school principals. In our analysis, we included stakeholders who could be influenced by our setup, i.e., whose role in the value co-creation of the collaborative activity we could somehow plan or affect through design of collaborative setting. Particularly in the principals’ interviews traces of more distant stakeholders were also seen but we did not include them in this analysis. Teachers are a very significant stakeholder group in our projects. They are essential in allowing access to school-children as well as in helping to organize and execute the project in practice – this aspect will be discussed in more depth from researchers’ perspective later on. School-children are the ones for whom the projects are planned for; their learning of collaborative design related skills is in the core of the projects. Another significant stakeholder group in our projects have been the junior researchers working in the projects. Without their time and effort, the projects would not have been possible to execute as the senior researchers would not have been able to use that much effort for the projects. Senior researchers, us, are the ones planning and organizing the projects in collaboration with teachers, with a goal to further our research objectives. Finally, in school environment, principals are significant stakeholders in our projects even though they are not directly involved in the activities of the projects and value co-creation for them is not as critical as with the other stakeholder groups. Principals, however, are the ones who allow access to their schools and create the background conditions for the projects so that the projects can succeed. Therefore, co-creation of value to them is also important. Next, we go through each stakeholder group separately to show value created for them in the projects. From teachers’ perspective, luckily, there seem to be clear benefits derived through working with us. All involved teachers reported that they learned in our projects new things related to design and technology, telling that in addition to pupils also ‘I [the teacher] learned awfully much about game making’ (Project B). The teachers showed a lot of interest in the project work and one teacher in particular would have wanted to be included in game development herself too, as her ‘fingers were itching to make speech bubbles’ (Project C). Some of the created value concerned more general issues such as multi-professional ways of working with researchers. They told that they were ‘delighted of the multi-professional collaboration’ (Project B) and ‘wanted to learn more about it’ (Project D). One teacher described how she saw that ‘school and university are excellent collaboration partners’ as they both gain from the collaboration: universities have ‘fresh research results that can be exploited in teaching’ and schools offer researchers ‘everyday data about learning and teaching’ (Project C). Some teachers particularly wanted to gain experiences of novel teaching methods and practices and saw the projects as a possibility to do with children something the new curriculum requires from the teachers, i.e., phenomenon-based learning and crossing the borders between different school subjects. One teacher told that the new curriculum requires ‘exactly this kind of working as much as possible’ (Project C). She also told that she was ‘eager and curious to get a new viewpoint for how to approach a classic book’ with pupils as she wanted to ‘actively try out and develop different teaching methods.’ The teacher in Project B was happy about the topic of our project as technology and reading enjoyment are ‘not easily combined’. One teacher also emphasized the practical help gained in the classroom, as that enabled her to ‘focus on my own work,’ teaching children, and ‘leave someone else to worry about problems with technology and practical arrangements’ (Project B). For some teachers, the value created was very closely linked with the school curriculum and the subject matter they were expected to teach to children and they saw pedagogical value of the ways of working in our projects. They also emphasized pupils’ learning experiences a lot in their interviews, i.e., for them the value co-created in the project was heavily related to the value experienced and co-created by pupils. This even led to the reflection on what the teacher’s task and duty is in the classroom: ‘I expect that the pupils will also get a new kind of learning experience. The process itself is already an objective as the pupils get some understanding of different phases of project work, group work and goal setting … This is a new experience to the pupils, a new way of working … A teacher always has a goal that the pupils get excited of something or that they feel like they have learned something’ (Project C). Overall, one can summarize that teachers enjoyed the project work. For teachers, the value co-created was related to their own learning and professional development (i.e., learning about game design and development, project work, new teaching methods) as well as to that of children. Additionally, they appreciated the possibility for multi-professional work in which combining different types of expertise provided added value (combining recent research knowledge with practicalities in the classroom, practical help received in the classroom). As mentioned, teachers emphasized that children and the value co-created by them is an essential issue in this type of projects and they expressed their wishes and assumptions about pupils’ learning in the project. However, we wish to emphasize that it is the children’s own experiences and reports on them that need to be prioritized in the analysis of value co-creation by children, even if we start the discussion from adults’ (teachers’, junior researchers’) perspective. One of the pedagogical issues that interested teachers in our projects was that children learned transversal skills. Transversal skills – ‘21st century skills’ – are considered to be important to learn at school. They include a large amount of skills such as, e.g., critical thinking, problem solving, creativity, self-direction, teamwork, and information and communication technology literacy. The teachers told that children learned many such skills, as ‘children got familiar with group work and negotiation skills’ (Project B) and learned to ‘plan ahead, tenacity’ (Project C). In line with this, many children also stressed that they enjoyed working in a group of their friends: ‘Nicest thing in the game project was … group work’ (three girls, a boy in Project C) and ‘working with friends’ (a boy in Project C). ‘It was nice that we could decide the group members by ourselves’ (a girl in Project C). The children saw that they learned many ‘general’ skills such as taking responsibility of their work and doing the work in time: ‘I learned during the project … to take responsibility, because although you could freely make the game, it was group’s responsibility to finish by the deadline’ (a girl in Project C). One boy also mentioned that he learned ‘group spirit’. The children also told that they were happy as ‘all [group members] worked [actively] and we were able to finish everything with care and within schedule’ (Project C). The teachers saw that it is good for pupils to meet and communicate also with other groups of adults than only their teachers, and that the pupils also enjoyed ‘working with other people that their teachers’ (Project B) as they were from ‘the real world, students from the university’ (Project C). ‘Collaboration with different people’ is important (Project D), not only related to technology but that children ‘get to know other adults [than their teachers] from whom they learn something’ (Project D). Many children also generally enjoyed the creative design work and considered it interesting. They specifically mention, e.g., drawing, colouring game graphics, testing the software, freedom, and creative work in general as something they enjoyed. A boy reported that ‘game making at school lessons was really nice’ and a girl told that she was happy as she was able to do ‘something interesting’ (Project D). A junior researcher in Project D also confirmed that children were happy to work in the project, saying that he ‘was very positively surprised of the enthusiasm that some of the pupils displayed towards our project, it was nice to see how interested they were.’ The best thing in the project reported by some pupils was particularly ‘creative work.’ ‘Expressing oneself’ was also mentioned as well as ‘freedom to do things (…) because the drawings and so on could look like you, and you could freely do your own job.’ The children told that they liked when they ‘can make/invent something by yourself and bring that forth.’ (Project C). Children learned game design and development related skills and got understanding of design and technology more broadly. The teachers as well as many children themselves told that children learned a lot of how games are designed and developed, including that it is not straightforward and easy work but can also be ‘fun and challenging’ (a boy in Project C). The junior researchers also saw how children’s behaviour changed to more enthusiastic when they got better understanding of the nature of the project: ‘I was positively surprised that at the end of the project they were so interested about the project and they liked to be part of it. At first, they were a bit passive but it went away when the nature of the project was revealed and they understood what they had to do.’ (Project D). The teachers reported that children ‘felt that they were doing important work’ (Project B) as their work was going to be ‘on the school web page’ and it was ‘part of the [junior researchers’] university studies.’ (Project C) The children’s general interest in gaming increased also their interest in the project topic where the intent was to create a game related to the national epic: ‘I am interested in game design because … I am interested a bit because I myself like to play games.’ (a boy in Project C) When asked what was good in the project, two boys answered ‘playing games’ and one girl also told that there should have been more possibilities for playing games in the project. Some of the pupils would have liked to even continue work ‘on their own time’ (Project A) or even after the project ended: ‘The project has been really nice. It would have been interesting to continue it.’ (a boy in Project D). The teachers also assumed that our projects might ‘spark an interest’ in some children to consider technology and design field as their future work (Project C). The junior researchers confirmed that: ‘One 8th grader even got really excited about [game making] and in the future she wants learn more. She even said that this may be something that she wants do as her work.’ (Project D) A girl in Project D also confirmed that she had considered studies on IT field but had not yet tried to find more information on where to study. As can be seen, the teachers and pupils agreed upon many issues in their answers, while teachers provided somewhat more elaborate accounts. Then again, children’s own perspectives and insights are the most relevant ones to be considered here. Both adults and children emphasized learning of various kinds of transversal skills, game design and development skills and variety in the classes including people other than teacher, places other than the school and activities not traditionally associated with the subject matter. Most importantly, both adults and some children themselves reported of the projects sparking an interest for game design and development or for digital design and technology more broadly. We realize that the most significant value created for the junior researchers in the projects have been the study credit units that they have received. In addition to that, we assume that they consider fulfilling the course learning objectives as something valuable to them. Altogether five master’s theses have also been written based on the project data by the participating junior researchers. We take this also as value creation for them since the projects offered them interesting topics and data for the theses. Then again, the junior researchers have also reflected upon their own learning in the projects and it is clear that they have also gained other valuable things in the projects than mere credit units. Many of them reported that they enjoyed the project work itself. They had fun in the project and felt especially happy when they received positive feedback from the children: ‘The project was really fun.’ (Project D) ‘Positive feedback from the pupils was the best thing.’ (Project D) They also report that ‘a design project with children is worksome but rewarding.’ (Project A). The junior researchers also mention more general professional skills such as project management skills. A junior researcher in Project C mentions specifically ‘resource planning, division of responsibilities, organizing, planning, etc.’ Another junior researcher mentions here ‘meeting practices and how to conduct with a customer.’ (Project B) Other general skills mentioned include communication, organising research interventions, and creating posters for schools’ and researchers’ use. Hence, junior researchers also mention learning research related skills. How to work professionally with children and act as teachers was also emphasized among the junior researchers. In Project D, one junior researcher particularly valued this experience, telling ‘In the end I am happy that the project was a lot more than just making a game. It could be easier to just make a game but trying to involve other people who not are familiar with coding and that kind of things was quite challenging.’ Another junior researcher in Project C also pondered same thing: ‘Our main tasks in this project was to plan lessons and act like a teacher in school to help school children develop a game. I see that this way also the project team members learned quite lot.’ Typically, the junior researchers had not had much contact with young children or teenagers, as one of them describes: ‘I learned a lot particularly … working with young people. I had rather limited experience of working with children of junior high-school age. Now I have much more.’ (Project C). In addition to the group of junior researchers, a group of senior researchers has always been supervising and managing the projects. As we are typically the ones kickstarting the projects, it is naturally important that the projects generate some value for us. This also definitely has been the case as we consider the projects very valuable in several respects: we have received rich empirical data, the projects have enabled us to educate and empower the young generation in the issues of participation, design and technology (e.g. Iivari and Kinnula 2016a, 2016b; Kinnula et al. 2017a) and they have enabled us to really listen to children and to include their voices into technology/game design (e.g. Hartikainen et al. 2016; Iivari and Kinnula 2016b; Iivari et al. 2015; Iivari et al. 2014; Kinnula et al. 2017a; Kinnula et al. 2017b; Kuure et al. 2010; Molin-Juustila et al. 2015). In addition, the projects have enabled us to study these issues in depth and to contribute to the academic discussion around them (all above plus more). The projects have enabled our multidisciplinary research group to develop its ways of working as the quotes from our project management documentation show: Our first multidisciplinary project had ambitious aims of ‘learning multiprofessional ways of working,’ referring to different disciplines inside the university and their representation in the project steering group (Project A). It was ‘our first common and concrete research intervention’ that acted as a starting point for new multidisciplinary collaboration. The projects that have followed have had an important role in this, too. The practical work with schools, teachers, and pupils has also enabled us to ground our understanding and work on the practical realities of the setting as well as to align our work with the existing curriculum. The teachers have informed us on many practical matters to be taken into account and helped us to conduct the work in the classroom. The teachers have, e.g., indicated that this type of work necessitates extra scheduling work from them that we should take into account in our scheduling: ‘some special arrangements have been needed … [in the curriculum] there are many different language, literature, and media related topics that also need to be integrated in the project work.’ (Project C) As seen from this quote, teachers also do important work related to fitting our project work with the curriculum; that is needed to justify the classroom time: ‘Teacher has the pedagogic responsibility of children learning what they are supposed to learn.’ (Project C). In addition to this, teachers provide valuable practical help in the classroom: ‘Teacher does a lot of pre-work with children so that everything happens smoothly and efficiently when [designers] enter the school and work with children (…)’ (Project C) Teachers are also valuable participants in the projects as they have knowledge of the pupils in the class and that may be utilized in the practical activities: ‘The teacher selects the test persons to avoid e.g. a situation where people are laughing at others’ creations.’ (Project C) Teachers also know their pupils ‘and how to make certain pupils work and get excited’ (teacher in Project C) and, on the other hand, what are the skills of the pupils and what can be expected from them: ‘The class selected into this project is very good ability-wise, so they can work effectively during those lessons where teaching must be condensed so that there is time for the game work.’ (Project B). Overall, we can conclude that we see a lot of value in working with schools – teachers and pupils – and our data shows that teachers appreciate the collaboration too and consider deriving a lot of value through cooperating with us. The involved children report of learning valuable things and enjoying the work, too, but as they did not have a free choice to participate or to decline, it yet remains an open question how the experiences gained through our projects shape their future choices and paths taken – whether they see value in participating in this type of endeavors or in technology design and development more broadly also in the future or whether they rather try to avoid those. School principals, as leaders of their schools, look at the value created in various projects from their school point of view, i.e., value created to a teacher as they learn something new and utilize that in their teaching creates value to the principals as well as it benefits the whole school the principals lead. Schools take part in many different projects and networks and one of the principals motivated that with three central issues that are common to all those efforts: ‘One is development of pedagogical use of technology, another is development of leadership, [and then the third one is] combining the benefit for the child and change management’. When schools take part in different efforts it boosts schools forward in their teaching development: ‘Some of the schools got into projects, like [a local school] got to take part the Everyday Knowledge Society project, that was a good boost to them.’ One principal very strongly emphasizes that taking part in different efforts is ‘definitely’ worth it. Different development projects make it easier for the teachers to try out new and innovative things. One principal described how in the City education department there are ‘propeller heads’ who create ‘wonderful information and communication technology strategies’ and teachers should try to follow those in their teaching. That can be, however, very demanding as those strategies are rarely practical enough. The principal was therefore very happy with the university project where there were ‘small bites to eat’ for the teachers, i.e., things were more easily understandable and practical. The aim of this paper was to examine what kind of value emerges for different stakeholders in collaborative design work, and how could value co-creation lens help make sense of collaborative design process. We analysed four of our collaborative design projects conducted in school context, complementing that with more general data about projects in school environment. In our data set, many different stakeholders could be identified. Mostly they were very closely related to the actual project work at school such as teachers, children, and junior researchers, but we could also identify more distant participants, taking part, e.g., in project planning and/or management but not necessarily working in it, such as school principals and senior researchers. We looked at the experienced value of different stakeholders and applied the concept of value co-creation, where value is understood emerging from collaborative activity between actors participating in the activity, as we see that it provides a useful new viewpoint to the discussion of value-orientation in collaborative design projects in CSCW field. We argue that by taking the experienced value in focus, instead of the collaborative process or the object of collaboration, it is possible to understand better the contextuality of the design process and therefore the design process is also more likely to produce satisfactory results. Next, we summarize the perceived value from our projects for each stakeholder. We then show different categorizations that help in making sense of the value co-creation process and its outcome and continue by discussing the use of value co-creation lens in collaborative design process. Table 2 summarizes our empirical findings. The column of perceived value for the stakeholders in Table 2 indicates that the value for different participants had surprising similarities in our data. All hands-on stakeholders reported of really enjoying the work and having fun in the projects. Overall, learning of various kinds of new skills and development of competence was emphasized in our projects. Learning served both individual need of serving the purpose of their work but also the general basic human need of feeling competent in what people do. Learning is very relevant particularly in our context, but we welcome also other CSCW researchers to reflect upon the aspect of learning more seriously in their cases: it is not necessarily only the design outcome co-created, e.g., a CSCW system or service, that is to be seen as valuable and generating value, but the co-created design process and learning within (see also Iivari and Kinnula 2016a about process vs. outcome orientation in design projects). In our case, both teachers, children, and junior researchers reported learning a lot during the collaborative activity into which each party brought resources, i.e., their expertise that, combined, created value for all. They particularly reported on learning about (game) design and technology as well as various kinds of transversal skills. Differences could naturally also be identified as regards learning: teachers were eager to learn about and experiment with novel up-to-date teaching methods, whereas junior researchers additionally learned about research work and practical work in schools and with children. Principals gained both personal skills as well as considered teachers’ learning as important to them as leaders of their schools as well. Learning among stakeholders should be seen as very important also in other CSCW contexts; for example, in healthcare context, design and technology skills of the stakeholders may be seriously limited and, hence, the stakeholders may truly benefit from approaching the collaborative design activity also as a collaborative learning activity – along the lines of participatory design tradition (Bratteteig and Wagner 2016; Ciolfi et al. 2016; Kensing and Blomberg 1998). Other types of issues also emerged in our analysis. Both teachers and children reported of enjoying the variety these projects brought into the schoolwork: new people, new places, new activities were experimented with. This could also be considered in other CSCW contexts, but we wish to highlight that this type of variety may also be perceived as very negative in work contexts. Hence, it is very important to understand the subjective experience of value (Heinonen et al. 2013); what generates value for each stakeholder group and involved individual, as embedded into their everyday life. In our projects, the teachers also appreciated the practical help they gained in the classroom, as regards e.g. technology use. This is a concern of any CSCW project, too: regarding design projects or design outcomes, one should be sensitive to the intricacies of people’s situations and needs as surprising or small things may be valued a lot. Important is to understand and be responsive to the various concerns and expectations influencing the stakeholders. As for children, we are very happy to see reports on children’s increased feeling of ownership and agency generated in our projects. Children were given a lot of decision-making power in our projects and the involved schools emphasized the outcomes of the projects, i.e., the games, making them available for others to use, too. Very importantly, we see reports of children’s interest being sparked in design and technology more broadly, our projects possibly affecting their career choices in the future. This we see as a highly valuable outcome of our projects. For any participatory design endeavor (see e.g. Bratteteig and Wagner 2016; Ciolfi et al. 2016; Kensing and Blomberg 1998), these outcomes are to be appreciated. Often it is not a question of career choices, however, but feeling of empowerment as regards design and technology (see Kinnula et al. 2017aabout different types of empowerment) that is very significant in the contemporary increasingly digitalized everyday life. Additionally, gaining experiences of multidisciplinary collaboration was valued both by teachers and us. Teachers appreciated up-to-date research knowledge as well as practical help, while for us, teachers help in grounding our work to the practical realities of the school setting was valuable. For researchers, naturally, possibilities to conduct meaningful research work and collect rich empirical data is important, and for participatory design research, possibility to empower children in design and technology is invaluable. Empowerment of people, in different senses (see Kinnula et al. 2017a) is a concern of CSCW research, too (see e.g. Adeel et al. 2013; Borchorst et al. 2009). We maintain that empowerment should be seen as a value that is to be co-created in the design process and/or with the design outcome in almost any CSCW project. When looking at perceived value in Table 2 through our analytical lens (Figure 1), the effect of context in the value experience is clear: a large part of the experienced value is related to learning different skills and competences, which is very natural when the projects have been embedded in school every day work. Some of the experienced value was intended, such as children learning about (game) design and technology or senior researchers getting rich empirical data. Some of the experienced value was, however, unintended, although a positive surprise, such as junior researchers’ feeling of benefitting others through one’s work or children feeling that the work they do in our projects is important to others. The dynamic and temporal nature of experienced value is particularly clear regarding the value experienced by us, the senior researchers. As is often the case with perceived value, the meaning of the experience can be understood even years after the actual experience took place (Law et al. 2009; Weick 1995). We don’t have recent reflections from the other stakeholders but we know from our own part that we have been able to look at the data from new angles and to get new insights even years after the projects have ended. On the other hand, it shows also in the perceived value by other stakeholders (Table 2): Some value was experienced in situ in the classroom, such as enjoyment of the collaboration between the children, the teachers, and the junior researchers, while some value experiences required the whole half-a-year project and resulted in new skills for participants or, e.g., credit units for the junior researchers. It is also possible to see that the experiences of value from the projects (perceived value in Table 2) can be categorized into two types according to whether they are ‘tangible’ and related to 1) the outcome of the process, such as teachers learning about (game) design and technology, children learning transversal skills, or principals acquiring resources for their schools through development of school learning environments (equipment, building related, support resources), or more intangible, related to 2) the process itself, such as enjoyment of working with the project, increased variety in the schoolwork (different people, places, activities) for children, or junior researchers feeling that they benefit others through their work (see also related discussions in e.g. the service literature about the technical and process quality of service (Grönroos 2008, 2011) and Cockton (2006) about experiences and outcomes). These categories emerged with all the stakeholders, who, however, all experienced the benefits in different ways, depending on the role they were playing in their organization. Therefore, we were also able to see the categorization of the results according to the level they gained meaning: 1) those relating to personal needs were individual by nature, such as learning new skills or enjoyment of the work and 2) those benefitting their role in the organization were organizational, such as researchers learning how to ground their work to the practical realities of the school context or principals getting increased management and leadership skills (see also the individual-organizational axis as discussed by Cockton (2006) through individual and collective worth). When looking at the value co-creation process itself, we can see that at least two factors influenced the experienced value: resources brought to the process and innate needs of the stakeholders (Figure 2). According to SDL, integration of resources of different stakeholders makes it possible to result in co-creation of value for all the stakeholders. Indeed, we can see from the perceived value in Table 2 that by integrating in these projects the resources from different stakeholders, all the stakeholders experienced value. Looking at the perceived value from resource point of view, it is possible to see that new resources were also created in the resource integration: we combined together junior and senior researchers’ knowledge and resources related to technological applications and design process, teachers’ and principals’ knowledge and resources related to pedagogical issues and school/classroom setting, and children’s knowledge and resources related to their learning and life in general and this resulted in, e.g., increased skills of stakeholders. Moreover, we found the layer of different innate needs (Alderfer 1972) affecting the co-creation process and eventual experience of value as particularly interesting (see Figure 2). Particularly the factors behind intrinsic motivation – basic human needs of Autonomy, Competence, and Relatedness – in the Self-Determination Theory (Deci and Ryan 1985) were helpful when we tried to form a deeper understanding of the nature of experienced value. Roles of the stakeholders as one dimension affecting the experience of value (see Figure 2) emerged from the data as well. For example, the teachers taking part in the projects were personally interested in self-development and the pedagogical use of technology, but in addition, their experience of value was guided by their role as a teacher. Therefore, the issues that helped them in developing professionally benefitted also the school community. These issues were typically about tangible outcomes such as new resources for teaching work, while enjoyment was more about meeting their personal needs and expectations. The same applies to other stakeholders as well: their role in the organization influenced the experienced value especially regarding tangible outcomes, while meeting their personal needs and expectations was shown as enjoyment of the process itself. Categorizing perceived value in our projects. When looking at Figure 2, process-related value at individual level is related to experiences of Autonomy, Competence and Self-fulfillment. Autonomy in Self-Determination Theory is about feeling of control of one’s own life and harmony with oneself – experiences of enjoyment, ownership, and meaning. Competence, on the other hand, is about experiencing mastery and being in control of one’s own work. We see this in itself as a highly important outcome relating to the impact of affective level on individual motivation. Studies of learning have shown that switching between emotional states in addition to intrinsic and external motivation has an effect on learning (Picard et al. 2004), and we see this as an important aspect also in terms of collaborative design work as involvement of technology and new skills requires learning for all participants. From the Self-Determination Theory point of view, participants should also be allowed to have a certain degree of freedom and ability to decide freely of their doings, Autonomy, without being tightly controlled. Process-related value at organizational level, on the other hand, can be connected to Relatedness: our innate need for interacting and connecting with others – finding purpose for our work and sufficient variety in it. From the Self-Determination Theory point of view, the collaboration should thus provide participants an opportunity to relate to others and gain feeling of being a useful for the community. Outcome-related value at individual level is related to different individual skills and competences developed through learning. In case of any stakeholder group, we emphasize that possibilities for professional development should be considered: added value is very likely generated if design projects and outcomes allow or encourage professional development. Outcome-related value at organizational level is related to work-related competences and sharing of competence, facilities, and other requirements within organization(s). From Self-Determination Theory point of view, participants should be given possibilities to feel competent – capable of completing a given task or gain feeling of being capable in some other terms that is beneficial for them or the organization. When looking at co-creation of value from the perspective presented in Figure 2, organizational aspects of experienced value in our data were related to the ways the project benefitted the organizational processes from the participant’s perspective: how it helped the individual to serve the organization’s purpose. For example, in the school context, for teachers it meant developing skills that are beneficial in teaching children; for principals, it was about developing the school in general. Individual aspects of value were more deeply connected to the innate psychological needs that help humans to experience their work meaningful; feeling of competence to do one’s work is also part of that. As there are several stakeholder groups with different needs, these needs become entangled in the interaction of the stakeholders and the collaborative work process (see Figure 1). The innate psychological needs that all human beings share cannot be separated from their work processes and they manifest themselves differently in different organizational settings. These needs emerged also from our analysis: we can see how the social-contextual conditions in the interactions guided the self-motivation processes of participants. Whether the participants are proactive and engaged, is determined by the context (Ryan and Deci 2000). Our discussion above shows that focusing on the created value instead of the collaboration process or the object of collaboration can be helpful in understanding and communicating why people want to take part in a collaborative activity. It also recognizes the active role of all participants. Understanding the expectations and supporting the experience of value of all stakeholders helps in supporting both the collaborative process as well as getting the expected result out of the collaboration. All relevant stakeholders need to be recognized in order to use value co-creation analysis as an analytical tool. Value co-creation, as understood in SDL, defines collaborative activity as a process where stakeholders participate through integration of resources with their unique skills and competences. This expands the scope of a “stakeholder” to include people who are not direct “users” of technology or “design participants” taking part in the actual design activity, to those who, for instance, are needed to make the collaborative process possible by making the needed infrastructures and resources available through managerial or political decision-making. The variety of stakeholders to be acknowledged in the design process has been recognized decades ago (see e.g. Eason’s (1988) discussion on primary, secondary and tertiary users or Soft Systems Methodology taking into consideration the variety of stakeholders and their perspectives, e.g. Checkland 2000); hence, this finding in itself is not new. Then again, we claim that the emphasis on the importance of different stakeholders’ value expectations and value experiences in collaborative activity is novel and valuable for the CSCW community. A practical challenge in acknowledging all the relevant stakeholders is that the collaboration always happens in a larger context and defining the border for which stakeholders should be included in the analysis and which are out of the scope of the analysis can be difficult. We propose that the analysis is extended to stakeholders who can be influenced by the design setup. For example, in our case policy making processes were not part of the collaborative activity under design, so stakeholders who participate in policy making were not included in the stakeholder analysis even though some principals mentioned these stakeholders in their interviews. Value expectations of stakeholders (both individual and organizational) need to be analysed as that is an important prerequisite to understand their motives to participate in collaborative activity and to foster creation of value to them. As we did not have value-orientation as our original focus in data collection we did not have that data available from all the stakeholders. However, we know from our own experiences in the projects we have organized that the initial value expectations may, and often do, change during the course of collaboration. For example, our original expectations in Project A were to learn multi-professional way of working within the university community. During the project that was extended to include teachers at the school as well. Therefore, it is important not only to compare perceived value with value expectations but also to recognize that stakeholders might have limited understanding about value creation opportunities to start with, and through learning more, these expectations might change. Value co-creation analysis can help in making the value expectations of researchers more visible and easier to communicate, therefore fostering value creation. This could be applicable also for designers working in collaborative design contexts, where designers can have their own agenda, or they could benefit from understanding conflicting value expectations and differing perceived value of stakeholders. The value co-creation lens can also help us to evaluate success of a project if we know expectations and then analyze value perceived. We suggest use of our analytical lens (Figure 1) and the value categories in Figure 2 for discussing the expectations of different stakeholders and also for communicating them more clearly. They can also be used when analyzing data to find perceived value, or, when planning the project, for considering what kind value is intended to create for the participants. Analysis of value co-creation focuses the analysis on how the stakeholders are able to meaningfully integrate their knowledge and other resources (Vargo and Lusch 2016) to create value through collaborative activity. This can be seen as an “assemblage involving skills and practices” (Deleuze and Guattari 1988; Finken et al. 2014). We suggest analysing what are the resources – knowledge, skills, practices, material resources, etc. – different stakeholders bring to the value co-creation process and making those also visible to the participants. By that, the stakeholders have a possibility to recognize significance and meaning of their own participation and possibly also experience additional value through that, like in our data the junior researchers felt that they benefitted others through their own work. Resource integration should also be considered already when planning a project. If the activities have been planned in detail beforehand by one of the parties, it leaves less room for co-creation in the form of resource integration, i.e., designers’ detailed plans for collaboration do not acknowledge the other stakeholders’ context-specific knowledge and competences. Resulting value can be intended but also unintended. Particularly in experimental situations, as research projects often are, it is often difficult to plan the collaborative activities in detail beforehand as they unfold according to the situations arising during the events of interaction and the experienced value unfolds accordingly. When using value co-creation approach the contextual, dynamic, and temporal nature of value need to be acknowledged. This understanding needs to be combined with the value expectations of the stakeholders as they are, too, contextual, dynamic, and temporal. Basic human needs affect what kind of value is experienced. To foster creation of value to all stakeholders, both the individual and role-based needs need to be recognized in order to produce value not only through the outcome, but also through the whole process. We contribute to CSCW research by introducing the use of value co-creation lens for conceptualizing, understanding, and further supporting collaborative design work that involves various kinds of stakeholders, including designers and users (Bratteteig and Wagner 2016; Ciolfi et al. 2016; Kensing and Blomberg 1998). We argue that our theoretical lens (Figure 1) as well as the model produced by our analysis of stakeholder perceptions of value and possible reasons and motivations behind those in school contexts (Figure 2) are useful for shedding light on the way the process is experienced as a whole and are applicable and useful in other organizations and collaborative work contexts as well. This approach should help to plan for collaborative design projects with a more value-oriented perspective rather than object-oriented perspective, taking into account why people want to take part in a collaborative activity and what they gain of that, and resulting in projects that are more context-aware and more likely to produce satisfactory results (see also Bossen et al. 2010; Bossen et al. 2016 about stakeholder gains). We therefore suggest to use value co-creation analysis as an analytical tool in collaborative design work, whether planning it or analyzing results of it. It can be used for empowering and motivating design participants as well as for evaluating project results. In further studies on the use of value co-creation approach in collaborative design work, it would definitely be interesting to see if other researchers encounter similar kind of value experiences as we did (Table 2). It would be particularly interesting to see if learning new skills and competences is a typical experience in other contexts as well, as mutual learning is such a fundamental aim especially in Participatory Design projects. Our results also bear implications to the theory of value co-creation. Our data shows that similar experiences of value emerge for different stakeholder groups, some more closely related to the projects and some more distant. This can be explained by the fact that co-creation of value is really co-creation where expectations, needs, and collaborative work intermingle even though interactions are connected to different organizations (see Figure 1). This widens the perspective of created value from the commonly used definition of value as a benefit for the beneficiary, as in SDL, to a wider need of the individual to feel agency and be capable and useful for one’s community. We invite further studies on deeper understanding of the value categories of Figure 2 and their use as well as definition for co-created value. Regarding limitations of our study, our projects have been conducted in school context and value experiences in other contexts are most likely different. The context of school is also very specific compared to, e.g., business related contexts in companies. On the other hand, our analytical lens (Figure 1) is not context specific and we see the value categories in Figure 2 as very general and not specifically dependent on participants’ personal profile, expertise, age, skills, etc. We report results from only four projects, inside one city and cultural context, but in four different schools with different teachers and children. Results from other cultural contexts may differ, even in projects conducted in school. For researchers working with schools we still specifically suggest that they consider should they try to co-create such kind of value for the participating children and teachers as we have identified to be of value for the participants in our projects. Schools are examples of extremely value-led organizations: the focus is always on children and their learning and the co-created value should somehow serve this objective and thus value co-creation approach is very suitable to use when working with schools. Our projects have emerged from our wish to bring participatory technology design work to school context and that surely affects our approach, data collection, and analysis work. We also invite further research on the use of value co-creation approach in other value-led organizations to see whether the approach fits well with them, too.